Yesterday I started to play with the rather new Corona render engine which has just been released for Max and is currently in development for Cinema 4d, Blender and Maya. There is a free alpha version available for Cinema 4d. This version will remain free until summer at witch point hopefully the release version will be ready. I downloaded this version Yesterday and I’m very pleased with what it does at this point. It is very fast, especially for a cpu renderer, easy to set up and delivers gorgeous results. I can highly recommend to download it and give it a try! However, there is one nasty bug – surprisingly the only one I came across so far – that crashes the plugin after the second frame or so when rendering animation. According to their forum this doesn’t always seem to be the case, but I couldn’t get Corona to render more then two frames. Now, since I mostly do animation and Corona’s speed and quality really turned me on, I was looking for a workaround and found one in the combination of a script and a little plug-in. So for those of you interested, I’ll describe briefly how to get it running. This will probably be redundant soon when the next update arrives, but until then it might be helpful. The main idea is that one frame always renders safely. So you could spend all day rendering an animation one frame after the other. Not much fun. But this is exactly what the plug-in script combo will be doing for you. It will restart the (one frame) rendering with new settings until a given end frame is reached. Download the script and the plug-in: CoronaAniRender.py (script) – ScriptCaller.pyp (plug-in). Unzip. Install the script, either by putting it into the Cinema 4d script folder (C:\Program Files\MAXON\CINEMA 4D R15\library\scripts) or by importing it from within Cinema from the Script Manager (Script Manager: File -> Import…). Open the Customize Commands Window (Window -> Customization -> Customize Commands). 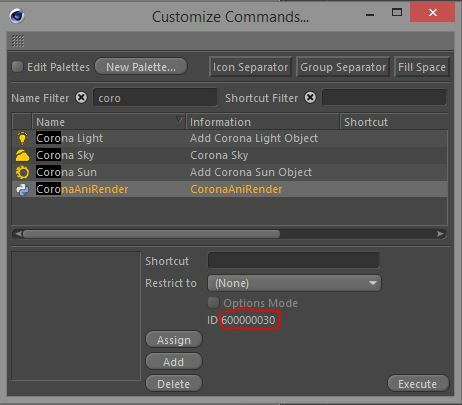 Start typing “corona” in the Name Filter field until you see the CoronaAniRender script listed. Click on the script and copy down the ID displayed in the bottom right corner. 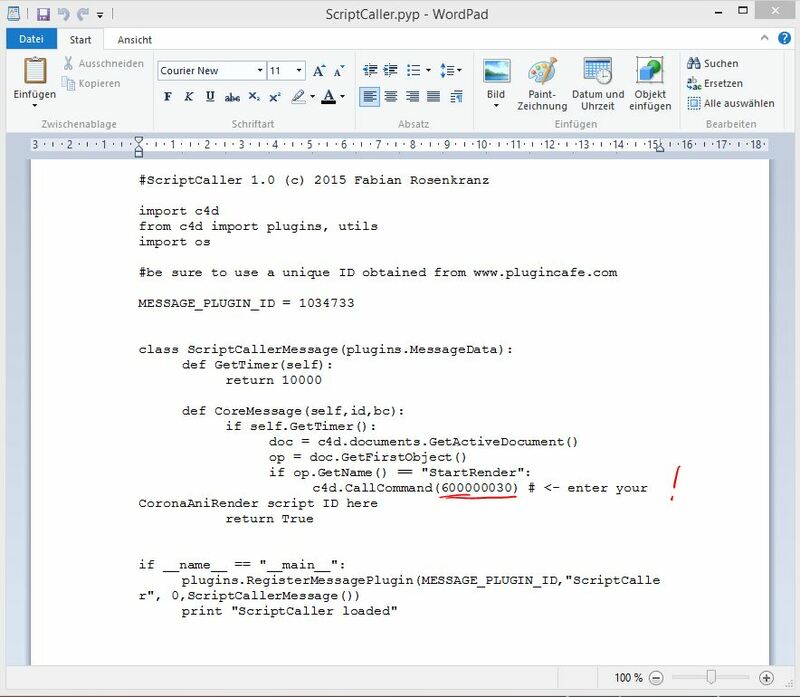 Open the ScriptCaller.pyp plug-in file in a text editor (not Word!). Word Pad will be fine. Find the line that starts “c4d.CallCommand(600000030)” and replace the number with the one you copied in the last step. This is necessary because the plugin starts the script by calling its ID. Unfortunately script IDs are not static, unlike plug-in IDs, so you need to adjust that for every Cinema installation. Save the plug-in file and put it into Cinema’s plugin folder (C:\Program Files\MAXON\CINEMA 4D R15\plugins). Now the installation is done. Restart Cinema and open the file you want to render. This is the result of a 3d project in my daughter’s class. I captured the faces of all the pupils introducing themselves with Faceshift and rendered this movie with Cinema 4d. I didn’t have the time to edit the results as much as I would have liked to, so this is pretty much how they came out of Faceshift.